Due to distribution agreements with Kluson, this product cannot be shipped to the EU (Austria, Belgium, Bulgaria, Croatia, Cyprus, Czech Republic, Denmark, Estonia, Finland, France, Germany, Greece, Hungary, Ireland, Italy, Latvia, Lithuania, Luxembourg, Malta, Netherlands, Poland, Portugal, Romania, Slovakia, Slovenia, Spain, Sweden, United Kingdom) by WD Music Products USA, but can be fulfilled by WD UK (except Germany) (https://www.wdmusic.co.uk/). The Kluson® 2 Post Steel Block Tremolo is a contemporary tremolo bridge designed to directly replace the bridge systems for Fender® American Standard Series guitars from built from 1987 to 2016 or American Professional series guitars introduced in 2017. This tremolo combines the most popular features of the prior Fender® designs taking advantage of their shared mounting pattern. 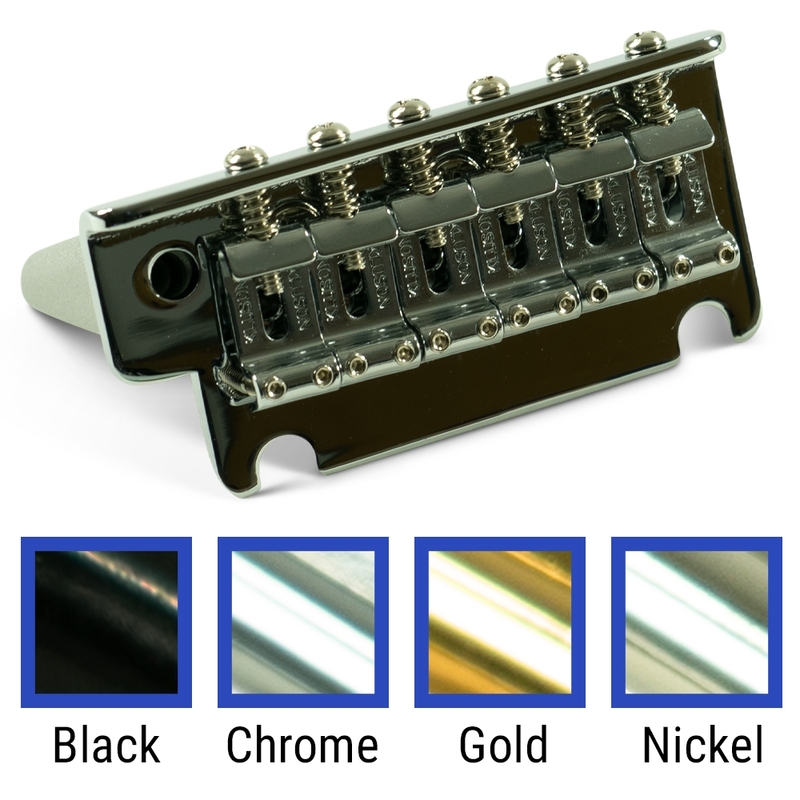 Key improvements over the traditional bridge include a refined block finish, true matching plating colors, additional plating options nickel and black, and replacement components that can be combined with original Fender® bridge assemblies (sold separately). The Fender® 2-point design introduced in 1987 featured a screw in tremolo arm and block saddles with an offset intonation screw (featured on the USA American Standard Series® and the USA Strat Plus®). The American Deluxe® series incorporated two “upgrade” features; a pop-in tremolo arm and plated block saddles. More recent, Fender®’s Professional Series Stratocaster® began using the traditional stamped steel saddles with a redesigned mounting plate for non-offset intonation screws. Kluson® has taken what they feel are the best features of all three versions of the Fender® 2-point design and incorporated them into one bridge that serves as a replacement for all and offers builders an excellent option with recognizable features.